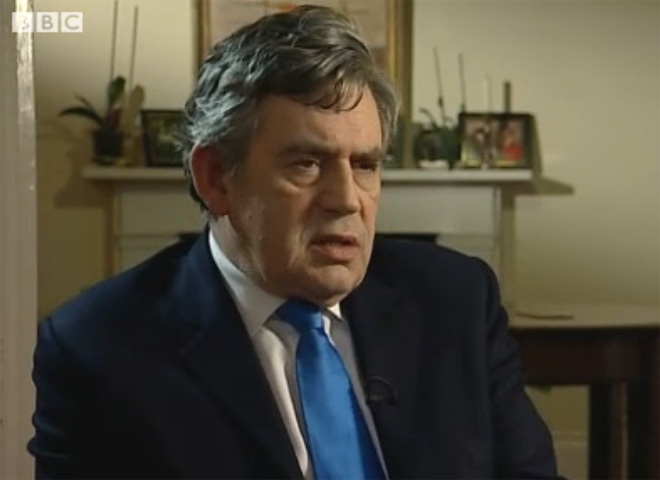 LONDON  Former British Prime Minister Gordon Brown on Tuesday accused Rupert Murdoch's newspapers of employing criminals to obtain confidential information about his family, his private financial affairs and the lives of ordinary people who were at "rock bottom." Brown's furious denunciation of the politically powerful News International papers came a day after questions were raised about how The Sun newspaper obtained confidential information in 2006 that Brown's infant son Fraser had cystic fibrosis. In an interview with the British Broadcasting Corp., Brown said he and his wife Sarah were in tears after being informed by Rebekah Brooks, then the editor of The Sun and now the chief executive of News International, that the paper knew about his son's illness. Brown also accused The Sunday Times of employing criminals to hack into his bank and tax records. Prime Minister David Cameron said Brown had highlighted what "looks like yet another example of an appalling invasion of privacy and the hacking of personal data," and said he was determined that the current investigations would get to the bottom of it. Outrage over the long-simmering allegations of wrongdoing at the Murdoch-owned News of the World exploded last week when it was claimed that employees of the newspaper hacked the phone of Milly Dowler, a 13-year-old murder victim, as police searched for her in 2002. The employees allegedly deleted some voicemail messages, giving her parents false hope that the girl was still alive and using the phone. With breathtaking speed, the scandal has disrupted the media mogul's plans to take over highly profitable satellite broadcaster British Sky Broadcasting and slashed billions off the value of his global conglomerate, News Corp.
"This was a culture in both The Sunday Times and in other newspapers in News International where they really exploited people  I'm not talking so much about me here now, I'm talking about people who were at rock bottom  and rock bottom was the rock upon which The Sunday Times founded their reputation, and other newspapers in News International founded their reputation, for purely commercial gain and in some cases to abuse political power," Brown said. "What about the person, like the family of Milly Dowler, who are in the most desperate of circumstances, the most difficult occasions in their lives, in huge grief and then they find that they are totally defenseless in this moment of greatest grief from people who are employing these ruthless tactics with links to known criminals?" Brown did not identify anyone he believed to be a criminal employed by News International. In a brief statement responding to Brown, News International said: "So that we can investigate these matters further, we ask that all information concerning these allegations is provided to us." Brown said he knew of no legitimate means by which The Sun found out about his son's illness. "They will have to explain themselves," he said. "I can't think of any way that the medical condition of a child can be put into the public arena legitimately unless the doctor makes a statement or the family makes a statement." A News International official, speaking on condition of anonymity, asserted that the information was obtained legitimately. Later Tuesday, London police officers faced questions from a legislative committee about why they didn't pursue a phone hacking investigation at the tabloid News of the World two years ago. Before the hearing, opposition Labour Party legislators called for the resignation of John Yates, assistant commissioner of the Metropolitan Police, who decided in 2009 that there was nothing more to investigate at the paper. Yates says he relied on advice from colleagues. Yates said News of the World and News International had not cooperated with investigators. "In hindsight, had I known what I should have known, it was a poor decision," he said. Ian Blair, the head of the Metropolitan Police from 2005 to 2008, told legislators that phone hacking by newspapers "was never a major issue in my time." "It was a tiny fragmentary event in the events that were taking place across London at the time," Blair said, as police were focused on the fight against terrorism. In 2007, a reporter and a private detective working for News of the World were sent to prison for hacking the voicemail messages of royal family employees. The scandal has also raised fresh questions about Cameron's judgment because he hired former News of the World editor Andy Coulson as his communications chief. Coulson, who had resigned from the newspaper in 2007 because of the hacking convictions, was arrested by police last week as part of the new investigation.